God gives us the ability to become fearproof. If we can only learn three things about the nature of God, then we can live full, peaceful lives without any fear. We may have made mistakes in our past, and it may be hard to forgive ourselves. It may even be hard to really understand the forgiveness of God since it is so hard for us to let go of things that other people do to us. 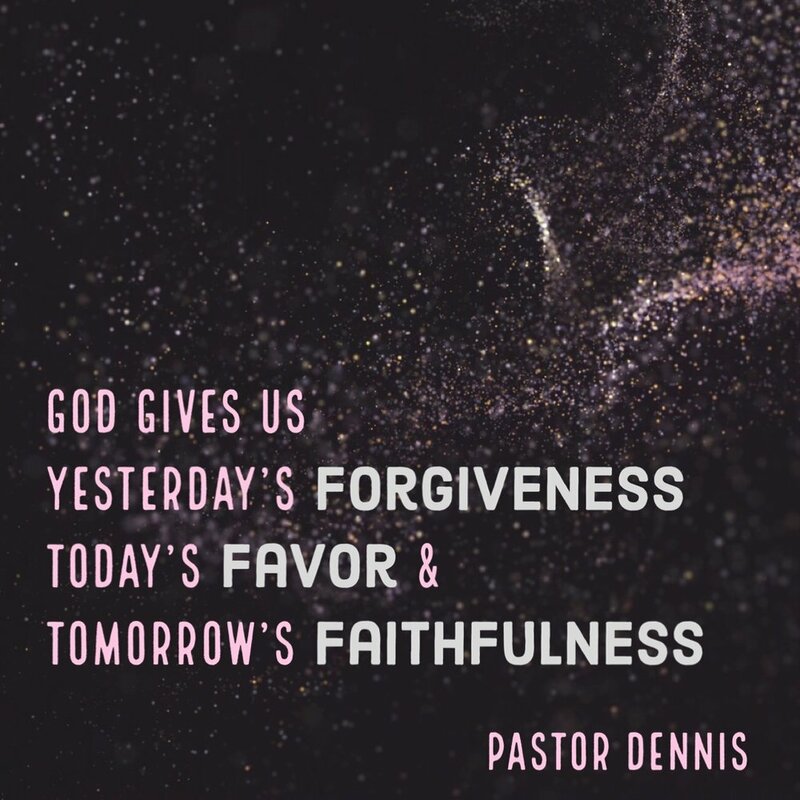 Forgiving and forgetting is something that is difficult for us, but is something God does every day! We can quit worrying about our past because His mercies are new every morning! God shows us his favor for us, His beloved children, by providing four things every day: provision for us, protection from evil and danger, power to overcome the enemy, and His divine presence. The real key, is our faithfulness for tomorrow. If we can throw our cares to God and truly be faithful that He will be there to provide for us, then we have nothing to fear! God has never changed. We do, we change our options about things, our priorities. But God has never changed - He is the same today and forever. There are three things that we can learn and become confident about regarding God and we can then become fearproof. Let it go. Yesterday is where our sins live - they can’t follow us into today. We worry that God might still be mad at us or that it might happen again, but those sins cannot follow us into today if we’ve repented of them. It is good for the heart to be strengthened by grace - by God’s divine favor. We deserve punishment, but we get God’s love and forgiveness instead. There is no greater fear but that God is angry and is holding something against us from our past. We know how we are - it’s hard to let something go as if it never happened, but God does. When He forgives, He settles it. Don’t live under the guilt and shame of the sins of your past = there's no need to fear about it. 1 John 1:9 - If we confess our sins, God is faithful to forgive them and cleanse us. Isaiah 1:18 - Though your sins are like scarlet, they shall be as white as snow… It’s hard to get a dark stain out of something white - there’s always a remnant of the stain because it’s virtually impossible to get something that clean. But God can do it. And He gave us that illustration to make it clear how removed our sins are from us when we are forgiven. Lamentations 3:22-24 - The steadfast love of the Lord never ceases, his mercy is new every morning. The Lord is my portion, therefore I will hope in Him. When you are saved, God doesn’t give you a bucket of grace and say “Use it wisely.” Thank God that’s not how it works! It’s a fountain, flowing and never running dry. Jesus told us that we are to forgive not once, not seven times, but seven time seventy times - He’s no hypocrite. If he will ask us to forgive that much, he will forgive us that much too. God gives us four things every day to show us His divine favor. God has promised to provide for those who trust Him. He said that the pagan people worry about having enough food, clothes, for all the necessities of life. They’re fearful because they have only themselves to trust to get those things. It is not so for God’s children. We don’t have to worry about those things because as long as we seek God’s kingdom first, all those thing will be added to us! Psalms 91:1, Psalm 46:1-2. I may trust that God is going to protect me, and then leave church and get hit by a truck… John the Baptist was beheaded after doing the work he was called to do. But, at the moment of death, we are taken immediately into the presence of God, and we are forever under HIs protection! If it’s not our time to go, getting hit by a truck won’t take you out - God has angelic “secret service protection.” The angels dwell around the camp of those who fear God. No weapon formed against a child of God will prosper if we’re living under God’s divine favor. God promises, every day, to give us the power to resist temptation. Temptation is inevitable, but not irresistible. We can’t keep it off of us, but we can keep it from taking hold. Billy Graham once said, “I can’t keep a bird from flying over my head, but I can keep it from building a nest in my hair.” If you feel like there’s a temptation that you can’t be delivered from, you’re wrong! God can forgive you and cleanse you, changing who you are and what you do! A child of God, covered with the blood of Jesus, can stand on their feet and say to the powers of darkness, “You have no power over me!” Faith as a mustard seed can move a mountain! If mountains aren’t moving in our lives, it’s because we either don’t know we have the power or we aren’t using it! We have power over darkness and the forces of the enemy - our power through Christ is greater than that of the enemy. Abraham once said, “If I’ve found favor in Your sight, don’t pass me by, stray with me a while.” And God did stay with him. Moses once pleaded with God - ‘If Your presence isn’t with us, then I’m not going to go!” God went with them - His presence always abides. In His presence is the fullness of joy. He promised never to leave us or forsake us. God favors us because He favors His son who is in us. Jesus was always 100% obedient to His Father - When (and only when) He is in us, God favors us. Any friend of Jesus is a friend of God. Psalm 91:9-10 - No evil shall be allowed to befall you, no plague come near your tent. Any man who commits his life and his home and his family to God, God will give that home and family favor. Once, when Paul was in prison and God miraculously moved to set them free by bringing the prison down. The jailer was about to commit suicide because he would be responsible for the prisoners leaving - Paul hadn’t left and said to the jailer that he and his house could be saved by following God. Everyone wants peace. No one wants to be miserable. The way we get that peace is not to worry over tomorrow. When the children of Israel were wandering in the desert, God had already proven Himself faithful many times by doing miracles for them. But, when they got hungry or thirsty, they accused God of bringing them into the wilderness to kill them. God took offense to this because He had provided for them so well! Of course, we’re not that different. If we watch the news or read about the difficulties facing mankind from Revelation. But God wants us to live in peace, knowing God will take care of tomorrow. Matthew 6;24 - Don’t worry about tomorrow, it will take care of itself! We are bound by time - we wish we could to into tomorrow, or go back even five minutes. But God is timeless and eternal - He is yesterday, today, and tomorrow. He’s already in tomorrow working things out for our good - let’s learn to trust Him. We should prepare for tomorrow, but not live in it. Today is already covered, and tomorrow can be left to God! Why do we find it so hard to let God have our future? It’s possible for a person to come to a place where they have turned loose and committed everything into God’s hands and they don’t stress or worry because they trust in God completely! It’s possible because God keeps encouraging us to do it!We can’t change anything by worrying - we can’t add inches to our height or seconds to our day. God has tomorrow covered, so don’t worry about it. We worry about what Satan will do to us, what he will do to our church… we don’t need to be worried about that. We need to be looking for what God’s going to do with our church! Don’t worry about what Satan will do to you, look for what God will do in you! The books of Daniel and Revelation paint a very grim future for earth. They didn’t write it so we could bite our nails over it - we win! God is going to be faithful to us in the future and take care of us so we have nothing to fear. He goes before us - leading the way, making sure we don’t go astray or stumble.